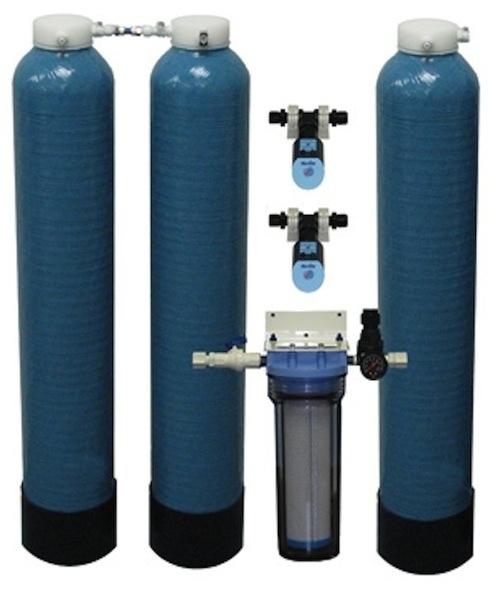 This three tank 12-LPM Type II/III DI System is designed for applications that require up 160-Liters of Type II/III DI water/day, when fed tap water containing up to 340 PPM of total dissolved solids. The system includes three installed plus one spare 7" (178mm) diameter by 37" (940mm) tall DI tanks, an activated carbon prefilter assembly with pressure regulator and gauge, and two purity monitor lights. When the purity monitor light indicates that the system is no longer producing Type II DI water, the first (and fully exhausted) DI tank in line is removed and returned to AQUA SOLUTIONS for refilling. The second and third DI tanks in line are moved to the first and second posistions and then, the spare DI tank is installed in the third position. This backwards rotation of DI tanks assures that all of the ion exchange capacity of the DI tank is fully utilized.The DI tank positioning can be accomplished in a matter of minutes, utilizing the tank's built-in quick-disconnect fittings. The end-user can easily do this without assistance or tools. Since all of the system hardware is purchased, there are no monthly rental charges. Input Power Requires two 110V outlet within 5 ft. of the purity sensor. I would like to request a quote for Type II High Flow 8-12 LPM.